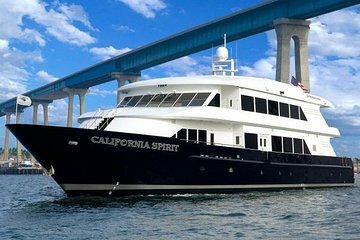 Enjoy Sunday in beautiful San Diego with a 2-hour brunch cruise on a luxury yacht. Help yourself to the seafood, steak, waffles and chocolate fountain at the buffet while sipping on unlimited mimosas. While you drink and feast, soak up the views of the water and the city skyline around you. When you’re ready to stretch your sea legs, head to the dance floor where live entertainment and music awaits. Your cruise will begin on Sunday morning at the Broadway Pier. Hop aboard your luxury yacht and toast your fellow shipmates with a full mimosa flute. As the boat heads out into the San Diego Bay, take in the views of the Coronado Bay Bridge, Seaport Village, the USS Midway Museum and the downtown skyline. Settle in to a spot on the upper deck or explore the vessel’s additional levels. After a mimosa or two, check out the delicious spread of your gourmet buffet. Sample waffles drizzled with fresh strawberries, locally-sourced salads, build-your-own omelettes, beef sirloin and more. Regardless of what you choose, just make sure you save room for the chocolate fountain. Then burn off a few calories from brunch on the dance floor, where either a DJ or live entertainment will be playing. Once your two hours of brunching and cruising are up, you will return to your original departure point. Please note: Menu subject to change without notice. Most dietary needs can be accommodated. If you have any specific dietary requirements, please advise at time of booking.